you’ll enjoy the convenience of being close to town, but feeling as if you’re miles from nowhere. This cabin is full of country charm and rustic touches, and inside you’ll find all of the comforts of home. 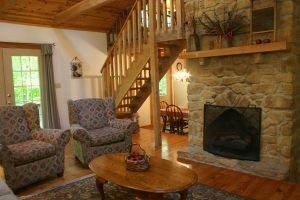 Brown County stone gas fireplace, ceiling fan, TV, mini stereo and a queen sleeper sofa. French doors open onto a large deck in back- with a view that gives the illusion of sitting in a tree house. A main floor full bathroom is roomy, includes wrought iron accessories, and has a tub/shower combo. and other wildlife. A fire pit and picnic table is just outside your door- for you to relax by and enjoy. You’ll find with a half circle drive and flat parking, there is easy access to town. This retreat is close enough to what you need, yet far enough away from what you don’t. This will be your new favorite get-away with that special someone or family.